From the books and movies, you know that Lord Voldemort can not be just hit with the Unforgivable curses and die. He has horcruxes. He has seperated himself into objects to be able to live. There are 7 horcruxes. 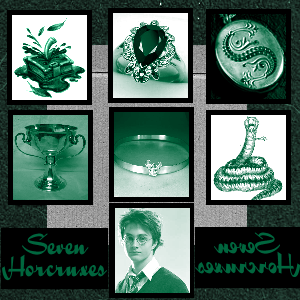 Tom Riddles diary, a Locket, his Snake (Nagini), a Ring, Ravenclaw's diadem, Hufflepuff's Cup, and Harry Potter. This is how Voldemort dies. He kills Harry, (all of the resat of the horcruxes have been destroyed) and when Voldemort kills Harry, it is only killing the horcrux in him. Therefore, Voldemort killed himself. The horcruxes were there so that it would be much harder to kill "the Dark Lord" but it did not work. Dumbledor had a plan to get them and it worked. Voldemort died.